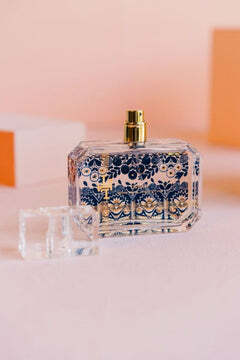 Frosted pink glass and a Spring-inspired gold design combine with the blooming floral fragrance of Millefleur, truly reminiscent of lush gardens through hints of jasmine, hyacinth, lily of the valley, orange blossom and raspberry. Two-piece carton was created to open similar to a flourishing flower with paper petals. Our non-metal wick provides a clean, pure burn time of approximately 48 hours.